Road to Battlefield V: One More Chance to Grab Two Battlefield Expansions Free* By July 17. Stage 2 on the Road to Battlefield™ V continues with another chance to claim a free* expansion for both Battlefield 1 and Battlefield 4, available until July 17, 2018. This is still the best way to earn rewards through a weekly progression system, with additional in-game content for Battlefield 1, and the opportunity to unlock items for use in Battlefield V* once that game drops on October 19, 2018. 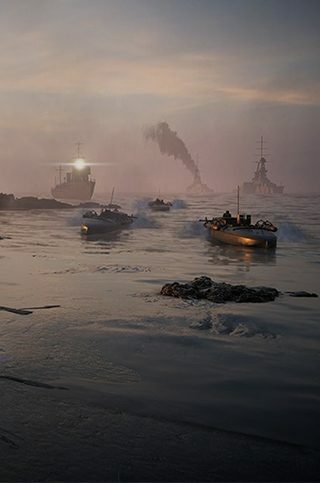 The Battlefield 1 Turning Tides expansion lets players fight in the 1915 British amphibious assault of the Gallipoli peninsula, where they can enter the clash alongside the Royal Marines on the powerful C-Class Airship and drop death from above. Relive massive battles on land, sea, and air within the maze of desert canyons of Achi Baba, choke point-heavy Zeebrugge, and two more maps. The expansion also provides eight extra weapons, the L-Class destroyer, M.A.S torpedo boats, and Heli blimps to dominate the seas. A complete breakdown is on the Battlefield 1 Turning Tides page. Battlefield 4 Second Assault expansion is also free* to owners of Battlefield 4, until July 17, 2018. This expansion was created as a love letter to the classic maps of Battlefield 3, redesigned with the power of the Frostbite 3 game engine. Players will get five new weapons, a Dune Buggy, ten assignments, and the Capture the Flag game mode. Remember, the Road to Battlefield V also includes weekly rewards just for playing Battlefield 1. These include legendary weapon skins, special dog tags, and Squad XP Boosts. A few rewards are designed for use specifically in Battlefield V once it launches in October. Check the Battlefield Calendar for more info. Every Tuesday, a different collection of maps will be featured inside Battlefield 1, grouped together based on a common theme, to feature the best Battlefield 1 has to offer. *Requires Battlefield 1, Battlefield 4 or Battlefield V on applicable platform (sold separately), internet connection, EA account, and, for console players, an Xbox Live Gold or PlayStation Plus account (each sold separately). You must log into Battlefield 4, Battlefield 1, or Battlefield V with the same EA account used to earn the rewards.